On 1 March 2015, the Post Office of Moldova (Poșta Moldovei) issued a postage stamp with the title UNESCO Musical Masterpiece of the Twentieth Century: Waltz «My Sweet and Tender Beast» by Eugen Doga. The issue comprises one stamp, with an associated cancellation (postmark) and first day cover (FDC). The designer was Vitaliu Pogolşa. The printing was performed by Nova Imprim, Chişinău. 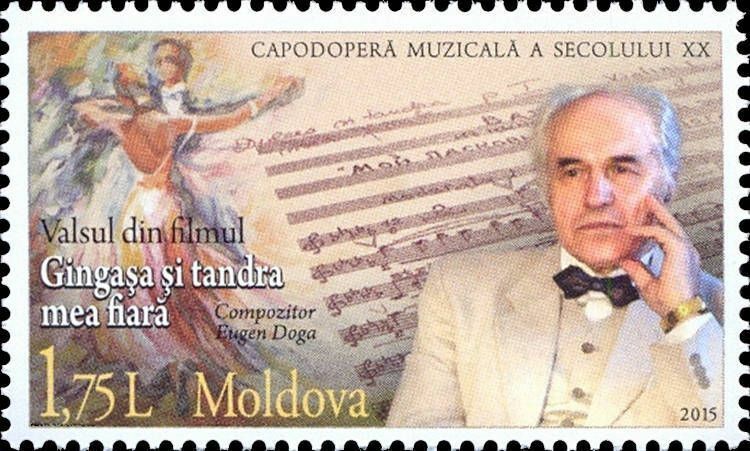 Eugen Doga (born March 1, 1937, in Mocra) is a Romanian-Moldovan composer. He writes music in all kinds of genres and styles, which makes him one of the most prolific and versatile composers. He has his own easily recognizable style. A creator of three ballets 'Luceafărul', 'Venancia', 'Queen Margot', the opera 'Dialogues of Love', more than 100 instrumental and choral works – symphonies, 6 quartets, 'Requiem', church music, and other, plus music for 13 plays, radio shows, more than 200 movies, more than 260 songs and romances, more than 70 waltzes; he is also the author of works for children, the music for the opening and closing ceremonies of the Olympic Games in 1980 in Moscow. Read more.. This article uses material from the Wikipedia article 'Eugen_Doga', which is released under the Creative Commons Attribution-Share-Alike License 3.0.